Do You Have Necessary Vital Information? My Alzheimer’s Dad (88) was very secretive, refusing to discuss legal or financial details with his family. Now he can’t remember his attorney, financial advisor, locate his life insurance, will, savings/investment documents. How do we find that information to help care for him? Dad left your family at serious risk. Alzheimer’s patients often exhibit paranoia and hide items in “safe” places. Search in, under, and behind every box, jar, drawer, cabinet, mattress and cushion in the house, including the freezer, cupboard, pantry, and refrigerator. At the very least, you may find cancelled checks/old bills leading to Dad’s professional advisors. If your search fails, retain an Elder Law attorney to help a.) locate Dad’s assets, and b.) 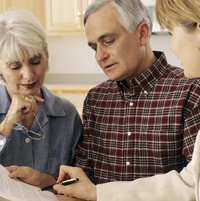 create a plan to keep you and your parents safe.